We are joining Vex Robotics FVC to be held in ONTARIO SCIENCE CENTER on Nov 25th. Team Leader: Adam Scott, Daniel. Interestingly, they uses the same Content Management System as we do. We will be using this "tick" image to illustrate what is the degree of involvement in practicing HANDS ON SKILLS at our workshops. As most of our workshops will train and present different level of HANDS ON SKILLS to the youth in organise, build, construct, program and document. We feel that this meter will provide parents a better indication of the skills involved. Our HANDS ON SKILLS meter will be measuring from 1, 3, 5 ticks. fischertechnik® is the flexible construction system for young and older system designers alike. Produced in Germany to high standards, these robot kits allow a multitude of systems and 3D models to be created by slotting precision-engineered parts together. Click here to find more about Rogers Cable 10 Tuesday 26 September When Little Scientist Club Founder Daniel Chun and introduces the various Junior Robotics workshops that the club offers to the local youth community. 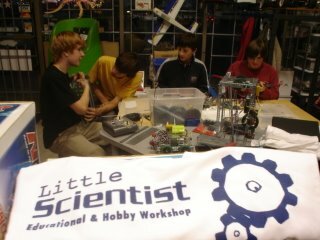 Little Scientist team joined FIRST LEGO LEAGUE in 2005 as a rookie team and have since advanced to a level where parents, educators, and the community have known us to be a formidable force in the independents category in junior educational robotics. We are an independent team not supported by any school, the team is financially supported by part susidy from Little Scientist and the youths' parents. It is a great value program for youths that has demonstrated ability and interest. In 2007, we are hoping that we can have 2 teams of 8 youths each joining us and represent us from Mississauga's community. This is a great opportunity for local youths aged 9-14 who have demonstrated ability in LEGO MINDSTORMS NXT platform and working with other youths. For youths who has not been involved in FIRST LEGO LEAGUE, we recommend taking our prequisite course of LEGO MINDSTORM 101 course (14 sessions). Find out what robots are and some of their history from J&J’s site. This page was designed by a group of students studying gears. Do you know the difference between worm gear and spur gear? Find Out! Find out how gears change speed and torque. Includes building and programming tips and lots of great information. A lego-robotics kit that can be bought in toy stores. Find out about cool things you can do with Legos! WHAT ARE OTHER SCHOOLS DOING WITH ROBOTICS? This school has been working with Lego Robotics for several years. samples from classrooms and a lot more! View incredible robot animals.Very cool! A site containing many links to Robotics in the world. Find out some neat things that robots do. Science gives a man a robotic arm. A BBC article on the Bionic Man. BBC article on hearing sensors given to a deaf man. Robots performing surgery? Find out. This is an ever growing list of mini-challenges meant to reinforce the class training material and to provide an exercise to use during FLL practice sessions. They can be done by multiple groups within the session and should be easy to follow. Once the kids understand the basic concept, they may be able to see how, or if, they could use the concept in some way on their robot. If you want to contribute your own mini-challenge let us know. We'll post them. These are in no particular order. The individual files are all in PDF form. The zip file also contains the Word versions if you want to modify or enhance them, per the license agreement of High Tech Kids.